It has a W16 engine and functioning 8-speed transmission. Lego has finally followed up its amazing Porsche 911 GT3 Technic kit with a kit that's arguably more amazing, and certainly has more pieces. 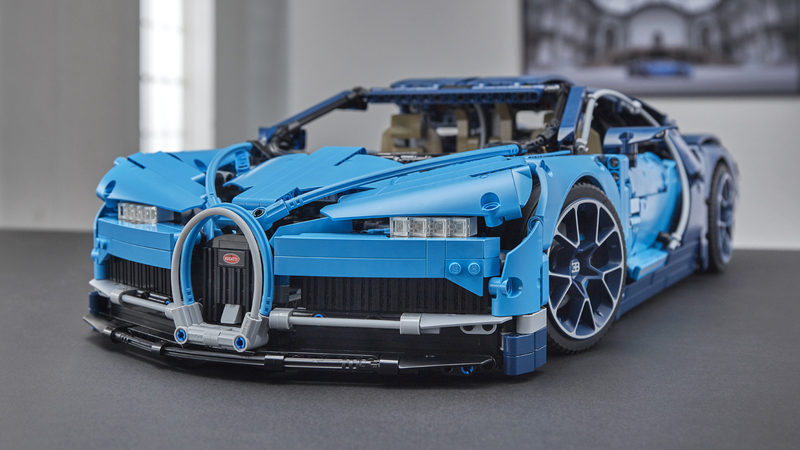 It's the 2018 Bugatti Chiron, and the 1/8 scale kit features 3,599 pieces, which is nearly 1,000 more than the 911. Those pieces make up an impressively detailed model just on looks alone. The blocky LED lights up front, the wide light bar at the rear and the trademark horseshoe design elements all translate surprisingly well to the Lego format. The interior has detailed seats and instruments, and there's even some Chiron luggage that fits under the trunk where there exists a unique serial number. But the really impressive stuff is under the plastic skin. Moving piston engines aren't new to Technic, but it is cool to see that Lego managed to create a tiny version of the W16 engine. You can clearly see each bank of narrow angle V8s and watch all the pistons dance. The engine is even hooked up to a real 8-speed sequential transmission. The transmission can be shifted via paddles in the driver's side footwell. The rear wing moves up and down, too, and is lowered for high-speed mode with a key you build out of Lego pieces. You'll want to make sure you have plenty of space on your table top for the finished product, since it's nearly two feet long. And budget plenty of time for assembling those thousands of pieces. But once you're finished, you'll have your own Bugatti Chiron with many of the same functioning features for so much less money. On that topic, the Chiron kit will cost $349.99, which isn't entirely cheap, but it is coming with a lot of parts and functionality. It's available through Lego stores both physical and online right now, and hits other stores on August 1.